Ten new minigames set for Spring 2010. Wii gamers are at least passingly familiar with Hudson Soft's Deca Sports compilation; it's shipped two million copies worldwide already, which ain't too shabby for a third-party title on Nintendo's console. Now DS gamers too will get a crack at the action, as Hudson has announced a portable iteration of its successful sports franchise. 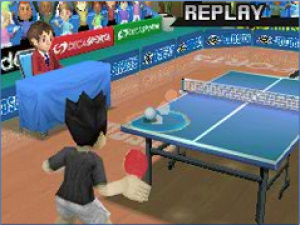 Deca Sports DS, or DS DS, will include ten new sports. Five of those are of the more traditional variety, like golf, ping pong, wall climbing, bobsled and rugby. The other five, well, they're a bit more unconventional, such as arm wrestling, clay shooting, cheerleading, sky diving and sepak takraw, which is a type of kick volleyball native to Southeast Asia. Up to six people can get in on the game and swear at each other when a friendly game of sepak takraw gets heated, although you can bring in more people to swear without a DS of their own. DS DS is slated for a Spring 2010 release in North America. Heard about this earlier. Interested to see how it turns out. I got a chuckle out of DS DS. That's about it. Will not be buying this. I like Deca Sports but I'm not getting this one.I didn't understand the swearing part.You guys need to make more sense. No ones buying this game, especially me. The only other sports compilation game I am getting is wii sports resort. The rest of this crap can just burn. I'm really interested in it. Nintendo Life should ban lame news. No thanks. I'll stick to the two Mario&Sonic sports compilatons. I have both the wii and ds versions of the olympic games software and will probably be investing in both formats of the winter olympics games coming soon. We have poured hours into the ds and wii version of M&S Olympics. This can't hold the same appeal by any stretch of the imagination! @Machu : i totaly agree...though,this is a new ds game,so they must inform us.maybe if ds/dsi had more new/good games,you would be right.